The 1942 Masters was the last one before play was suspended due to World War II, so the champion in 1942 held his title until the tournament resumed in 1946. And that champion was Byron Nelson, winning his second Masters and fourth overall major. 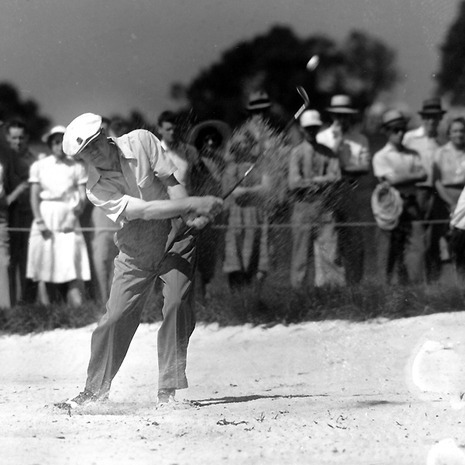 To earn that victory, Nelson had to overcome an old rival, Ben Hogan. Hogan and Nelson grew up in Fort Worth, Texas, and first met as youngsters among the caddies working at Glen Garden Country Club. In 1927, when both were in their mid-teens, Nelson defeated Hogan to win the club's caddie championship tournament. At the 1942 Masters, Hogan caught Nelson in the final round, shooting 70 to Nelson's 73, forcing an 18-hole playoff for the championship. Hogan started fast in the playoff, taking a 3-stroke lead after five holes. And Hogan played well the rest of the way, going 1-under over the final 13 holes. But Nelson played those remaining holes in 5-under, carding a 69 to Hogan's 70 and grabbing the trophy away from Hogan once again. Byron Nelson shot five under par the final 13 holes to defeat Ben Hogan 69-70 in a playoff. Hogan led by three strokes after five holes. Despite Hogan's shooting one under par the next 13 holes, Nelson won his second Masters title. 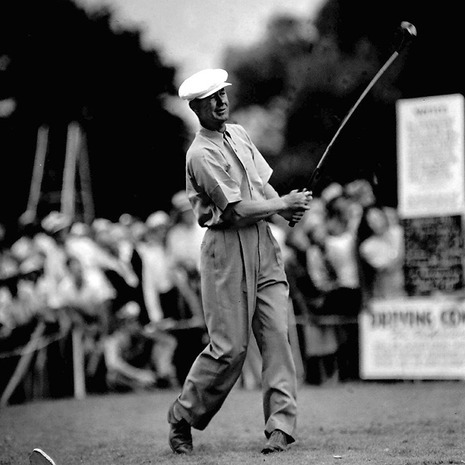 Nelson won his first major event at The Masters in 1937, winning by two shots over Ralph Guldahl. During this tournament he shot a first-round 66, which stood as a record as the lowest first round in the Masters history until Raymond Floyd had 65 in the 1976 event. Nelson would subsequently win four more major tournaments, the U.S. Open in 1939, the PGA Championship in 1940 and 1945, and a second Masters in 1942.